Claire is a composer and performer from Aberdeenshire, Scotland. Her work includes fixed media (stereo and multi-channel), site-specific, multi-media, live electronics and collaborative work. In 2005 The Final Journey written for the New Noise ensemble was selected for the opening of the SPNM Promoting New Music concert in London. In 2006 she was selected for the online Noise Festival and she wrote an Organ and Electronics work for Scotland's Sound Festival, which is due to be released later this year. In 2007 Être Fluide was released on the Ladyfest CD, three of her works were presented at the Tate Modern London plus her audio/visual work was presented at The Shunt Vaults London and at the Sonic Arts Expo in Plymouth. Most recently Claire's audio/visual work premiered in New York City and she composed the music for Brian Pollack's latest film 'Armed Ambassadors' which is due to be released in the US later this year. In addition to composition Claire is also involved in 'cello and electronic improvisational work as well as working with various contemporary music groups internationally. Recent performances include the 'Fast and Dirty' dance project, a 'cello and live electronics set at Chez Poulet Gallery San Francisco and at Thainstone Mart for the 24 Fragments closing event funded by the PRS Foundation for New Music and the Wellcome Trust. Claire has also performed with Marina Rosenfeld's Sheer Frost Orchestra at the Tate Modern London and worked with the Her noise project on Sonic Youth artist Kim Gordon's Reverse Karaoke at the South London Gallery. 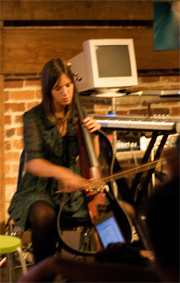 In 2007, Claire was awarded the PRS Atom Award for New Music, which funded her trip to San Francisco last year to develop her work with Max/MSP.